Three 1x4x12' wooden slats being glued together and clamped to a wooden form until dry. 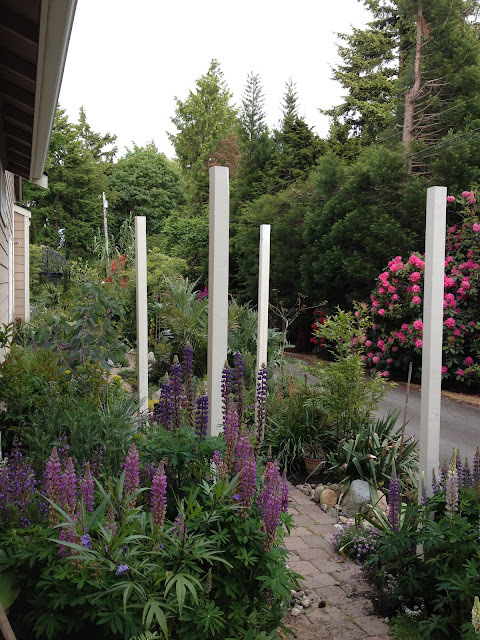 Meanwhile, I painted the supports for the trellis (4x4x8') white to match the trim of the house and connected them to steel anchors in concrete piers to ensure the trellis won't tip over in a windstorm. I at least made a good start on the project this weekend. There are four beams to bend, and each beam will take two days with all the glue drying time, so it will be at least until next week before I'm completely finished. Since it is going above the pathway, I want it to curve with the pathway. That presents the first challenge: bending wood. First, I graphed out on paper exactly how I want the bending to occur. 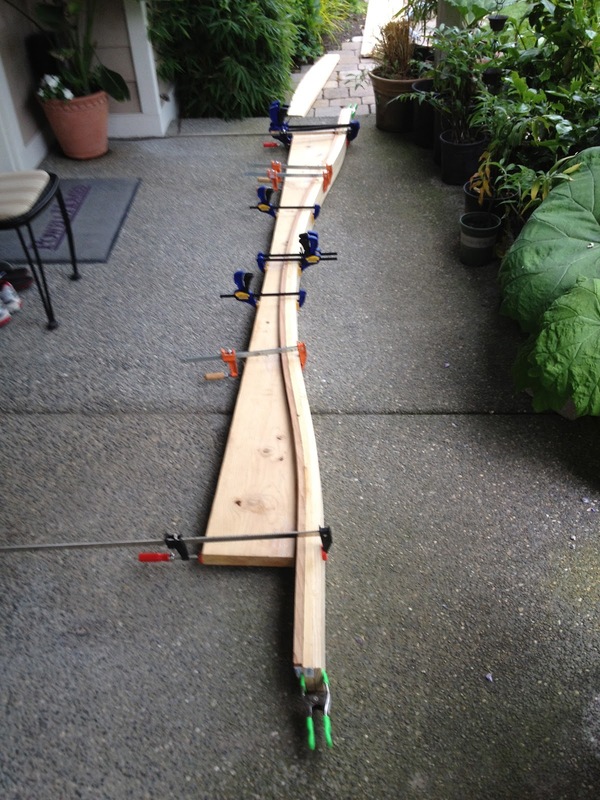 Then I plotted this shape onto a 10-foot long 2"x10" and used a Skil saw to cut it out. This will be the form that I clamp the longer, slender boards to in order to bend them into shape. If I had bigger clamps, I wouldn't have had to do this next step, but because I only have 6" clamps, I glued small pieces of wood onto the form that I will use to clamp the bending wood to. I also had to improvise and use a caulking gun as a clamp, which didn't work out too badly for future reference. I'm letting this dry overnight, and tomorrow I'll start the process of bending the wood that will eventually constitute the main supporting beams of the trellis. We've had a little over an inch of rain over the past couple days in Seattle. That's more than 12,000 gallons of water falling across the half acre of the garden. After two weeks of dry and warm weather, I have to admit the rain is a welcome change. It also gives me an opportunity to blog, since I would otherwise be doing something outside right now. 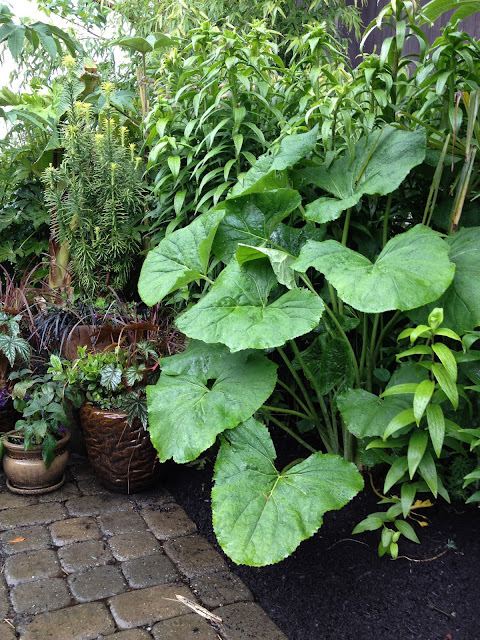 And, yes, lots of rain is required when growing lots of big leaves. 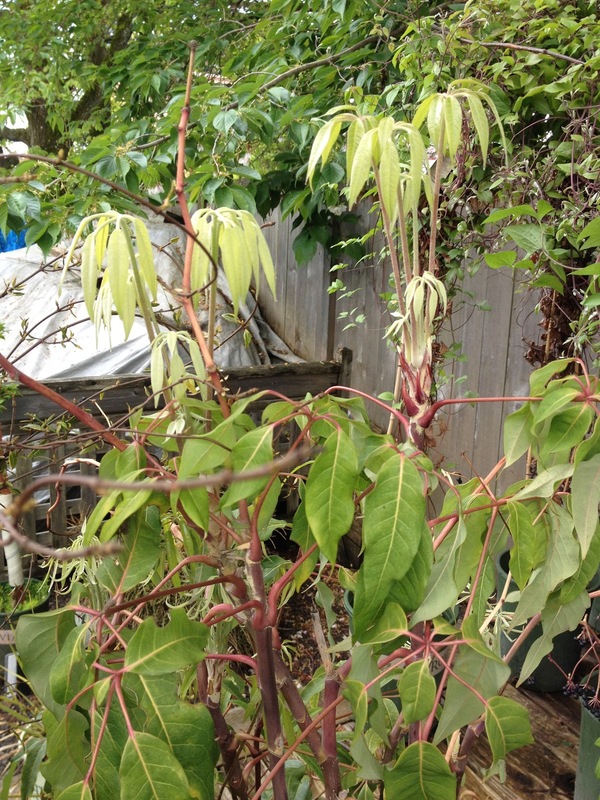 Mid to late-May is generally the time when the big-leaved plants really start to shine. 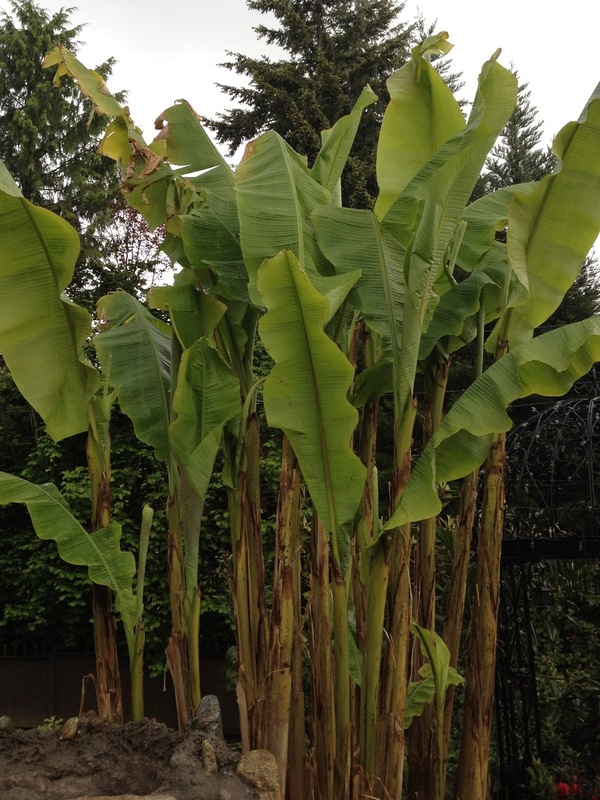 Although these hardy bananas (Musa basjoo) reach their peak in October, they are at least out of their ugly stage for the season. For those who don't suffer from the allergic reaction associated with this plant, Tetrapanax papyrifer is one of the coolest plants there are and everyone else should definitely grow it. It does sort of spread so put it in an area where it can run and do its thing. 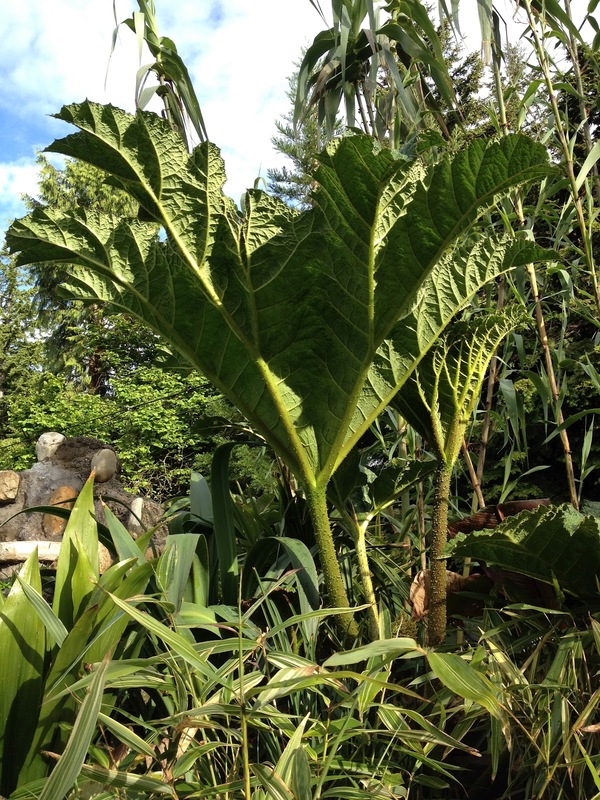 If you're lucky you'll soon have a Tetrapanax forest. 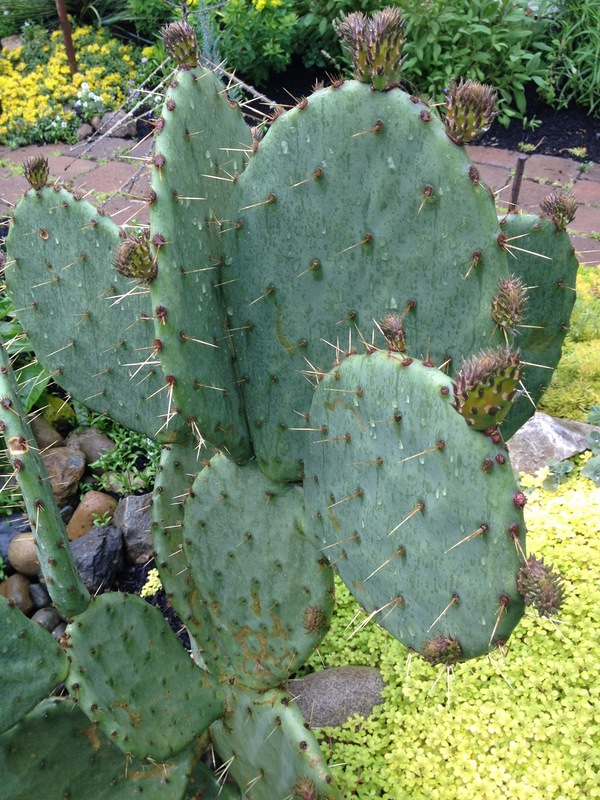 Opuntia cacti, or prickly pears, may be considered to be scrubby weeds in the southern US but they are a prized possession here in the Northwest - at least by the people weird enough to grow them. I've heard the new growth is edible but I haven't been brave enough to try it yet (they seem to have micro-spikes on them). I think I'll just hold out for the prickly pears. In addition to about 12,000 other phases, I'm currently in a "big annual" phase. One of the best big annuals for our area is Solanum aviculare or Kangaroo Apple. The many purple flowers give way to miniature eggplants in shades of green, orange, and then red. Its dark burgundy stems contrast incredibly well with the lush green leaves. It grows quickly - to 10' in a single season. 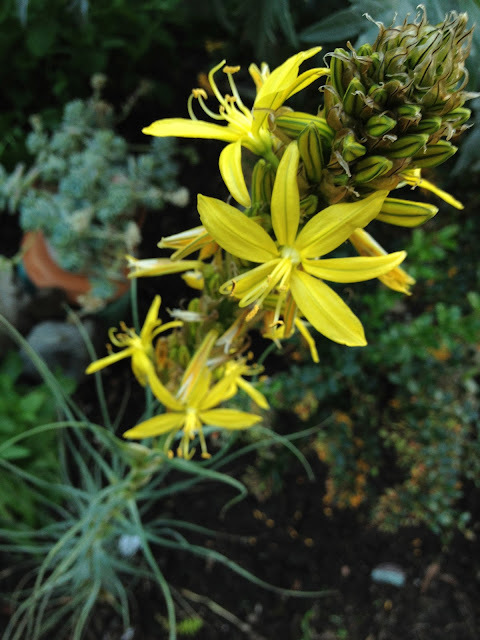 Just go online and order some seeds, then sprinkle them around in a sunny area that will get watered and stand back! 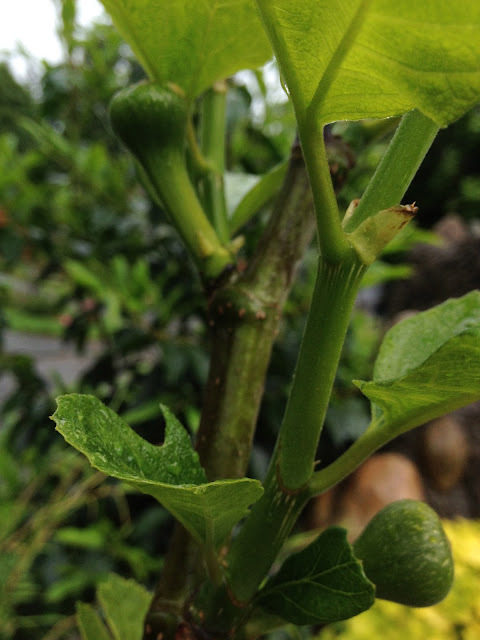 If the summer is warm enough, the fruit will drop to the ground in the fall and seedlings may sprout the following year. I believe the seeds have to go through a fermentation process like tomatoes. 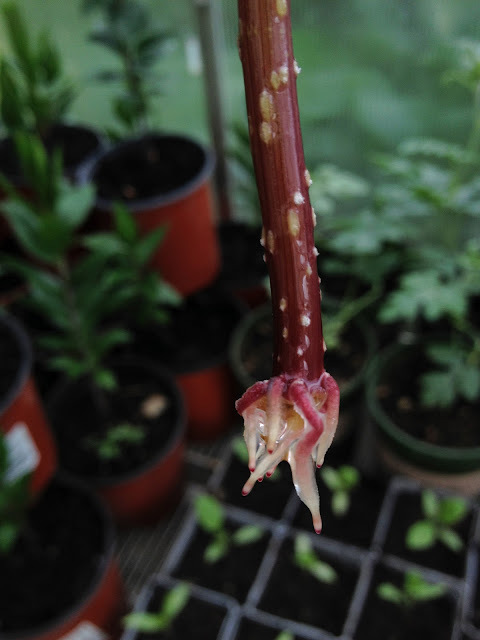 When I was potting up a tree Dahlia (Dahlia imperialis) a couple weeks ago, a section of one of the main stems broke off. So I took a shot in the dark and stuck it in a bottle of water. I was floored about a week later when I noticed some roots starting to form at the base. Two for the price of one! Finally....a few figs on a fig tree no bigger than a stick. The elusive thermal trough is back in Seattle. Sunshine, clear blue skies, and heat (low 80's) are what most plants have been waiting for. 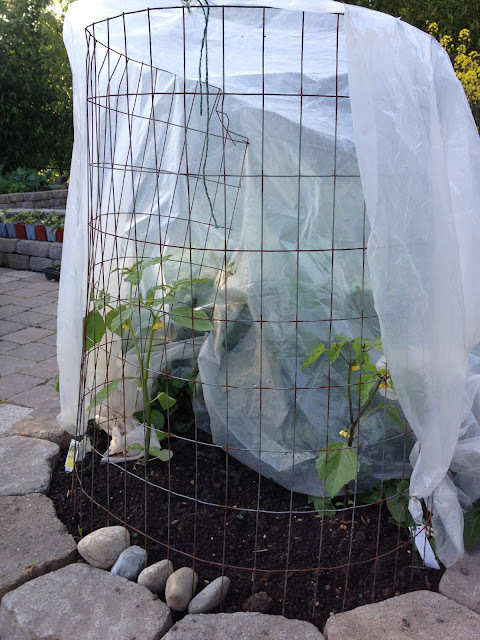 The relatively few plants that like it cool and rainy will manage to survive the party I'm sure. This heat wave (by Seattle standards) is our first after a cooler than normal spring which was beginning to feel like a repeat of last year's 2nd coldest spring on record. The nice weather just might give some plants that don't really belong in this climate, like the Canary Island date palm (Phoenix canariensis), a chance to bulk up a bit. 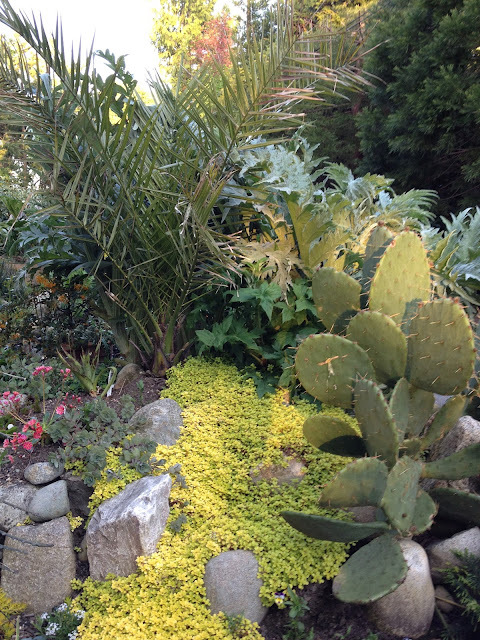 The bright yellow groudcover is Sedum makinoi 'Ogon', which has so far done a decent job of staying evergreen and seems to spread at just the right rate. Finally, I planted a couple tomatillos outside last week with a bit of protection. They are looking good and starting to grow! Let's keep thinking SUN!!!! You had me at brevipedunculata! Once in a while, I stumble upon a plant so rare Dan Hinkley doesn't even mention it in his Explorer's Garden books. Now when that plant is on the 50% off table at Swanson's Nursery, there must be some sort of imbalance in the universe. I quickly remedied the situation by buying this supposedly hardy Schefflera brevipedunculata for a mere $20. Justin: Uh...earth to mother nature: Can we press the reset button on spring and try again? Justin: Really? That was easy! Justin: So I'll be able to plant my tomatillos and giant pumpkins outside? Justin: Wow! You're the best thing since SIRI! Mother Nature: I don't talk to her kind.